We received a spam email regarding Jobs offer at Alerted.org. 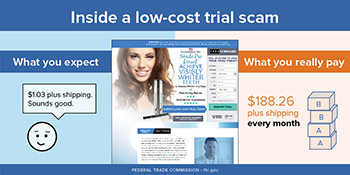 The Federal Trade Commission has charged an online marketing operation with deceptively luring people into an expensive negative option scam using an initial low-cost ($1.03, plus shipping and handling) “trial” offer for tooth whiteners and other products. Click to view infographic about low-cost trial scams. A federal court temporarily halted the operation and froze its assets at the request of the FTC, which seeks to end the practices. According to the FTC, the defendants used a network of 78 companies, at least 87 websites, and dozens of bank accounts to hide their ownership and launder the profits from the scheme. They also drove people to their websites via affiliate networks that generate web traffic with blog posts, banner ads and surveys. For example, some consumers got emails inviting them to fill out surveys falsely claiming to be for well-known merchants such as Kohl’s and Amazon, and were directed to the defendants’ websites to claim a “reward” for completing the survey. The FTC alleges that, using deceptive claims, hidden fine-print disclosures and confusing terms, the defendants tricked consumers into providing their billing information, and then started charging them about $100 a month unless consumers canceled within 8 days. They also used an order confirmation page to trick consumers into signing up for a second monthly subscription, which cost an additional $100, for an identical product. Because of this double-deception, the defendants charged consumers, who reasonably believed they had agreed to a single shipment for $1.03 plus shipping costs, about $200 a month until they canceled both unauthorized subscriptions. The defendants are charged with violating the FTC Act and the Restore Online Shoppers’ Confidence Act. The defendants are Blair McNea, Danielle Foss, Jennifer Johnson, Boulder Creek Internet Solutions Inc., Walnut Street Marketing Inc., and these LLCs: Anasazi Management Partners, RevMountain, Wave Rock, Juniper Solutions, Jasper Woods, Wheeler Peak Marketing, ROIRunner, Cherry Blitz, Flat Iron Avenue, Absolutely Working, Three Lakes, Bridge Ford, How and Why, Spruce River, TrimXT, Elation White, IvoryPro, Doing What’s Possible, RevGuard, RevLive!, Blue Rocket Brands, Convertis, Convertis Marketing, Turtle Mountains, Boulder Black Diamond, Mint House, Thunder Avenue, University & Folsom, Snow Sale, Brand Force, Wild Farms, Salamonie River, Indigo Systems, Night Watch Group, Newport Crossing, Greenville Creek, Brookville Lane, Honey Lake, Condor Canyon, Brass Triangle, Solid Ice, Sandstone Beach, Desert Gecko, Blizzardwhite, Action Pro White, First Class Whitening, Spark Whitening, Titanwhite, Dental Pro At Home, Smile Pro Direct, Circle of Youth Skincare, DermaGlam, Sedona Beauty Secrets, Bella at Home, SkinnyIQ, Body Tropical, and RoadRunner B2C LLC, also doing business as RevGo. The Commission vote authorizing the staff to file the complaint was 2-0. The U.S. District Court for the District of Nevada entered a temporary restraining order against the defendants on July 25, 2017. FTC v. RevMountain, LLC, Anasazi Management Partners, et al. In the agency’s first enforcement action against an education lead generator, operators of Gigats.com have agreed to settle Federal Trade Commission charges that the company claimed it was “pre-screening” job applicants for hiring employers when it was actually gathering information for other purposes, including lead generation for post-secondary schools and career training programs. According to the FTC’s complaint, the operators of Gigats.com gathered online job announcements posted by multinational companies, government agencies and other employers, and summarized them on its website, which appeared to accept applications for the jobs. Many of the job openings were not current, and for those that were, the employers had not authorized Gigats to collect applications or screen or interview applicants. In addition, the defendants never sent the information they collected from consumers to the employers. Instead, the FTC alleges, consumers, who had provided Gigats with the kinds of personal information typically requested in a job application, were directed to call the defendants’ “employment specialists,” who then steered the consumers toward enrolling in education programs that had paid the defendants for consumer leads. Many consumers also were transferred to the defendants’ “education advisors.” The FTC alleges that these so-called advisors falsely claimed to be independent education advisors but in fact only recommended schools and programs that had agreed to pay the defendants, typically from $22 to $125, for consumer leads that met their enrollment requirements. Under a proposed stipulated court order, the defendants are prohibited from making misrepresentations like those described in the complaint, and promoting job openings without a reasonable basis to expect that employers are currently hiring for those jobs. They also are barred from transferring consumers’ personal information to third parties without clearly disclosing that it will be transferred, and their relationship with the third party. In addition, the defendants are prohibited from using the information covered under the order unless consumers affirmatively opt in to their services. The proposed court order imposes a $90.2 million judgment that will be suspended upon payment of $360,000. The full judgment will become due immediately if the defendants are found to have misrepresented their financial condition. The defendants are Expand Inc., also doing business as Gigats, EducationMatch and SoftRock Inc., and Ayman A. Difrawi, also known as Alec Difrawi and Ayman El-Difrawi. The Commission vote authorizing the staff to file the complaint and proposed stipulated court order was 3-0. The proposed order has been submitted to the U.S. District Court for the Middle District of Florida. The FTC and State of Florida have taken action against defendants who ran an international tech support operation and allegedly misrepresented to consumers that malware or hackers had compromised their computers and that the operation was associated with or certified by Microsoft and Apple to fix their computers. A federal court has temporarily shut down the defendants’ operation, frozen their assets, and placed control of the businesses with a court-appointed receiver. The complaint alleges that defendants, based in Florida, Iowa, Nevada, and Canada, relied on a combination of deceptive online ads and misleading, high-pressure sales tactics to frighten consumers into spending hundreds of dollars for dubious computer “repairs” and antivirus software. According to the complaint, the defendants caused consumers’ computers to display advertisements designed to resemble security alerts from Microsoft or Apple. These ads warned consumers that their computers could be infected with malware and urged them to call a toll-free number in the ad to safeguard both their computer and sensitive personal information stored on it. According to the complaint, consumers who called the numbers in these ads were routed to the defendants’ call center in Boynton Beach, Fla., where telemarketers purported to run a series of “diagnostics” that inevitably discovered the existence of grave problems that must be immediately fixed at a cost of $200 to $300 by one of the defendants’ “certified” technicians. The defendants also frequently told consumers that they needed to spend an additional $200 to $500 to replace their existing antivirus software, which the defendants always claimed was outdated and ineffective. The complaint notes that consumers can acquire this software for a fraction of the cost charged by the defendants. In many instances, the software sold by the defendants to consumers with Apple computers is available as a free download. The defendants in the case are BigDog Solutions LLC (doing business as Help Desk National and Help Desk Global); PC Help Desk US LLC (doing business as Help Desk National and Help Desk Global); Inbound Call Specialist LLC; BlackOpteck CE Inc.; 9138242 Canada Corporation; Digital Growth Properties, LLC; Christopher J. Costanza (doing business as CJM Consulting, LLC); Suzanne W. Harris; Muzaffar Abbas; Gary Oberman; Donald Dolphin and Justin Powers. The defendants are charged with violations of the FTC Act, the Telemarketing Sales Rule, and the Florida Unfair and Deceptive Trade Practices Act. The FTC and State of Florida are seeking to permanently stop the alleged illegal practices and obtain refunds for the victimized businesses. The FTC has taken numerous law enforcement actions against tech support operations since 2010, shutting down the scams and collecting substantial consumer redress. The FTC has extensive consumer education materials about tech support scams, including a new video. The Commission vote authorizing the staff to file the complaint was 3-0. The complaint was filed in the U.S. District Court for the Northern District of Illinois. The court entered the temporary restraining order on June 28, 2016. Compute.info is a platform for social media research, analytics and data gathering.